We are Vietnam Freedom Tour who specializes in providing accommodation and travel services in Vietnam and South-east Asia countries. 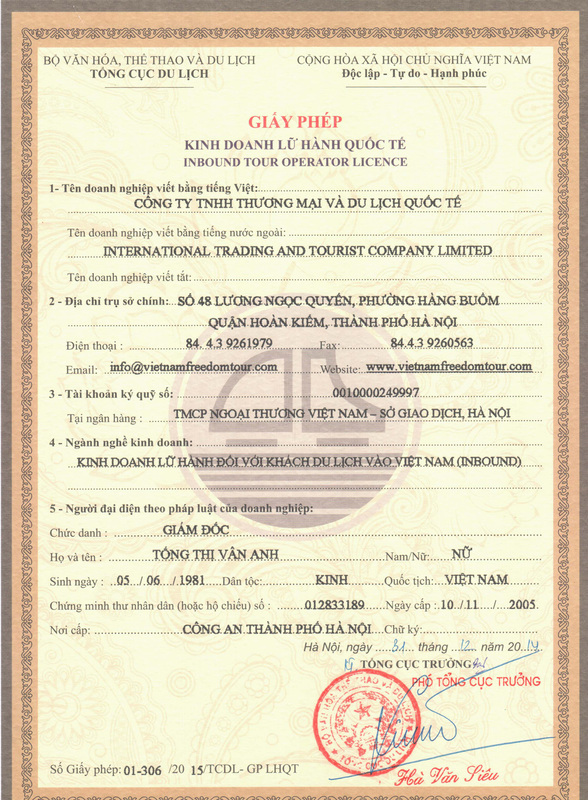 We are licensed as an International Tour Operator Company (License No: 0628/TCDL-GP LHQT) who can organize tours for travelers all over Vietnam and Worldwide. We recognize that our clients seek personalized travel experiences that are tailored to their specific wants and needs. We want your vacation to match or exceed your expectations, so we’ll work closely with you to create a custom itinerary that fits within your budget. Once you’ve chosen your desired destinations, let us take care of all the details. Thousands of options are available, including comfortable hotels from tourist-class to deluxe, full or half-day sightseeing, theatre tickets, museum passes, and private transportation, and even local tour guides, all at affordable prices negotiated by our local staff! We can even arrange economy or business-class airfare for you on most major airlines, plus rail passes and car rentals to get you from place to place quickly and easily! Whether you’re interested in touring all of Vietnam, the bustling big cities of Asia, or charming remote villages, we can customize the perfect itinerary for you. Vietnam Freedom Tour is also Visa Expert who can get a visa for you to Vietnam, Cambodia, Laos at any time. This is very helpful to you when the Embassies are not located in your country or the Embassies are far away from your town. In these cases, you have to spend a lot of money and time for getting a visa. But now, you don’t need to go any place, you don’t have to spend so much money and time for that. What you need to do is send us your request, you will get the visa in a short time (1 to 5 working days) at a low fee. With the idea of taking the great advantages of the Information Technology we designed this website with the ambition of providing useful information to assist any single tourist in finding the best way to travel in Vietnam, Cambodia, Laos, Thailand. We also want to build effective spans between Global Internet Users and South-east Asia Tourism also to connect them to Hotel Businesses by giving detailed information of hotel systems all over the area. We assure you, we will provide you high quality service at the best rates. It is easy to understand, since as a local company, we are in a good position to negotiate with hotels, restaurants, transport companies…for low price and also due to low operating costs in Vietnam. Our dedicated team of consultants are on-hand with a bright and friendly service. We are always available 7 days a week, 365 days a year to provide you information, assist you in making a best plan to travel in South-east Asia with your limited time. We are pleased with providing you necessary information you should know before starting your trip. We confirm to you that any of your personal information, which is required for the booking process will never be used for other purposes than our services (hotels booking, tickets booking, transferring, visa arranging….). Tel: (84-4) 66649889 – 66648868.